All-flash array startup E8 Storage is trying to carve a niche with its rack-scale D24 appliance, which packs two dozen 4 TB NVM Express-based PCI Express solid-state drives in a 2U chassis. E8 said its system blends local flash performance with centralized provisioning for highly available storage with fault tolerance. A D24 box provides 88 TB of raw storage that equates to roughly 70 TB of effective capacity. A single D24 rack can support 100 servers. Each server is able to access the same data. Capacity utilization approaches 90% by extracting full performance from the SSDs. 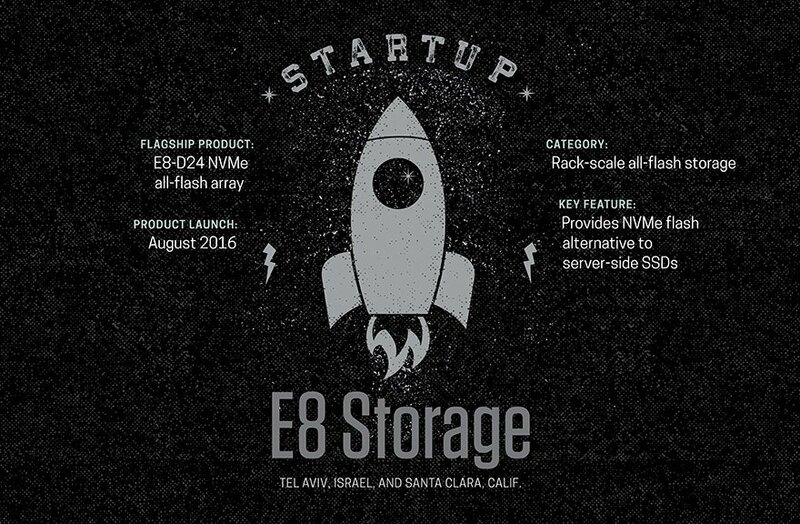 The E8 Storage array is aimed at enterprises considering local SSDs in a server-side flash model. Its disaggregated flash architecture allows customers to scale compute and storage independently. High-performance block storage, hyperscale data centers, NoSQL and SQL databases, and real-time data analytics are among the projected D24 use cases. The design integrates Mellanox Remote Direct Memory Access network adapters. The startup claims D24 SSDs will deliver latency and throughput comparable to that of host-attached flash. Connectivity support includes 40 Gigabit Ethernet and 100 GbE. E8 Storage rates D24 performance at 10 million read IOPS and four million write IOPS, with sub-100 microsecond read latency and 40 Gigabit per second read latency and 20 Gbps write latency. D24 flash storage uses commodity cabling, Ethernet network interface cards and NVMe drives in a bid to keep costs below that of competing proprietary systems. Dual controllers provide high availability, while E8 Storage software handles dynamic LUNs, RAID 6 and thin provisioning. Where do you see E8's NVMe all-flash arrays taking hold in data centers?